I have a wedding to attend in Tennessee soon, so here goes for a new dress. I'm using Simplicity 1357, part of their AmazingFit series. And sadly, I have recently gone back into the plus sizes, called Women's by Simplicity, probably to make us feel better. The fabric is a medium weight polyester from Joann's. It has a lovely drape but is quite slippery and difficult to sew, much like silk. I didn't make a muslin on this, instead choosing to fit it on me with the help of the pattern instructions. I ended up widening the waist, but taking it in at the bustling and shoulders. This last little alteration gave me a slightly puffed sleeve, which I rather like. I found an old Threads article on inserting a simple lining with the facings attached to the lining fabric, so I thought I would try it. According to the article, no interfacing is needed with this technique. 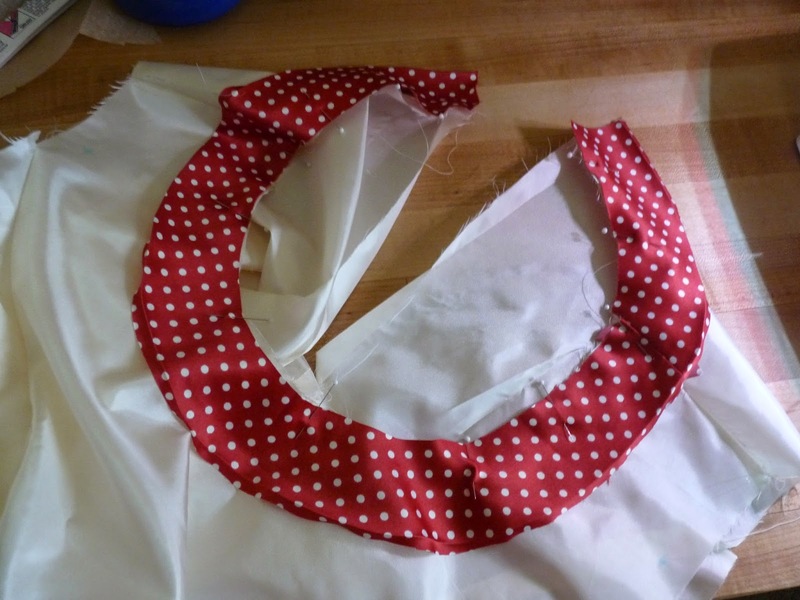 You sew the facings together, then attach to the lining at the neckline. 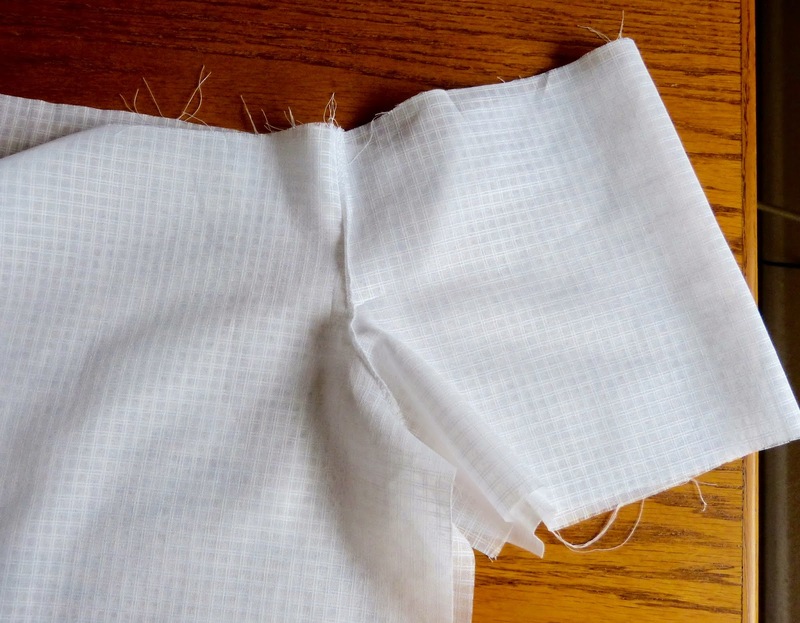 Fold under the long edge and edge stitch the facing right to the lining. I did decide to insert the zipper by hand, first by pinning to the fabric, then pick stitching, as shown above. It does take about two hours start to finish, but it is strong, secure, almost invisible and absolutely beautiful. It is a wonderful couture touch to give to your garments. Practically perfect zipper! Now on to the lining. Our local SAGA chapter got together to make this sweet dress in a class taught by Kathy Awender. (Click on the link to go to her home page). It just so happened that my trip to California coincided with this class. 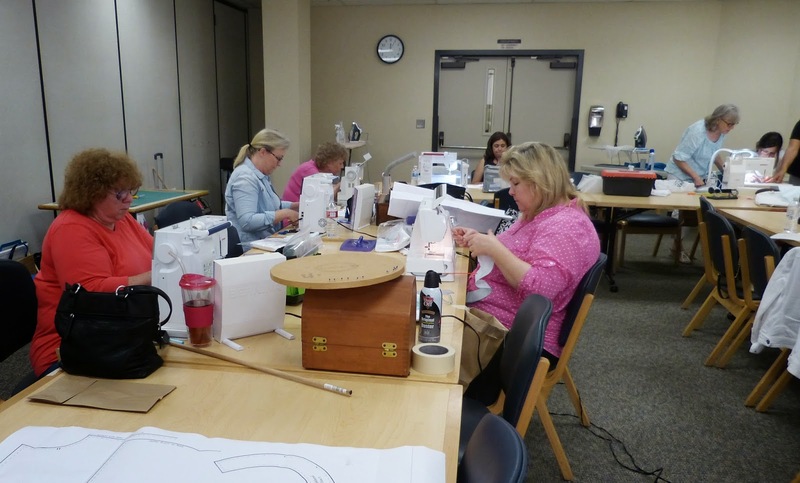 I had already registered for the class and had planned on making the dress by myself, but it was much more fun to attend the class in person. 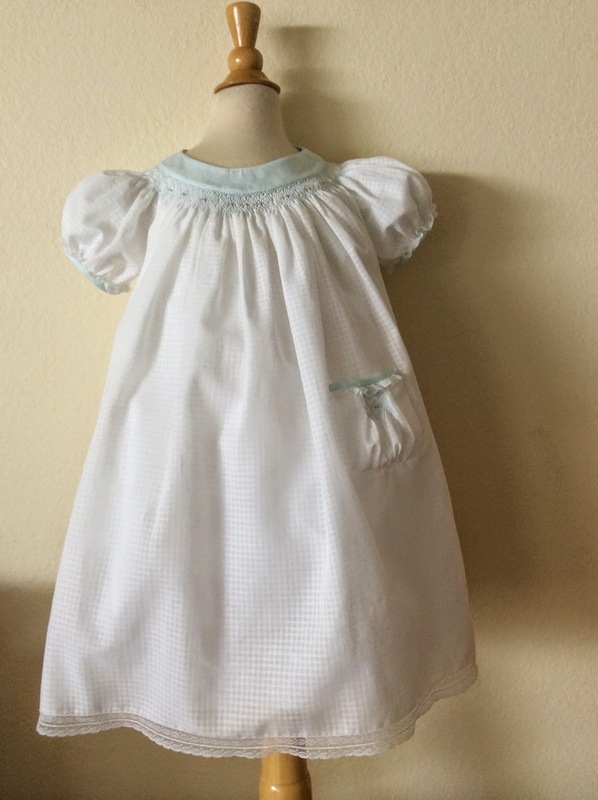 The dress is a size 3 modified bishop, with a neckband above the smocking. It's a nice change from the classic bishop. 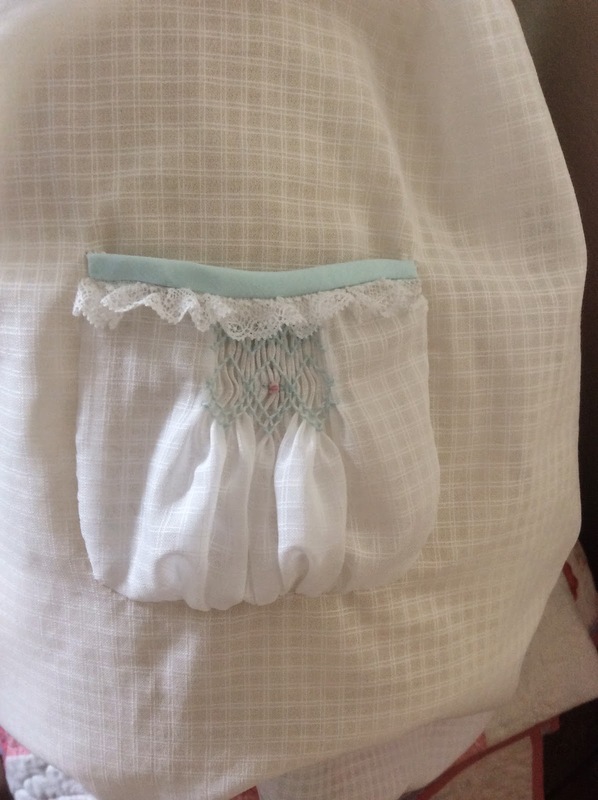 And it has a cute smocked pocket. 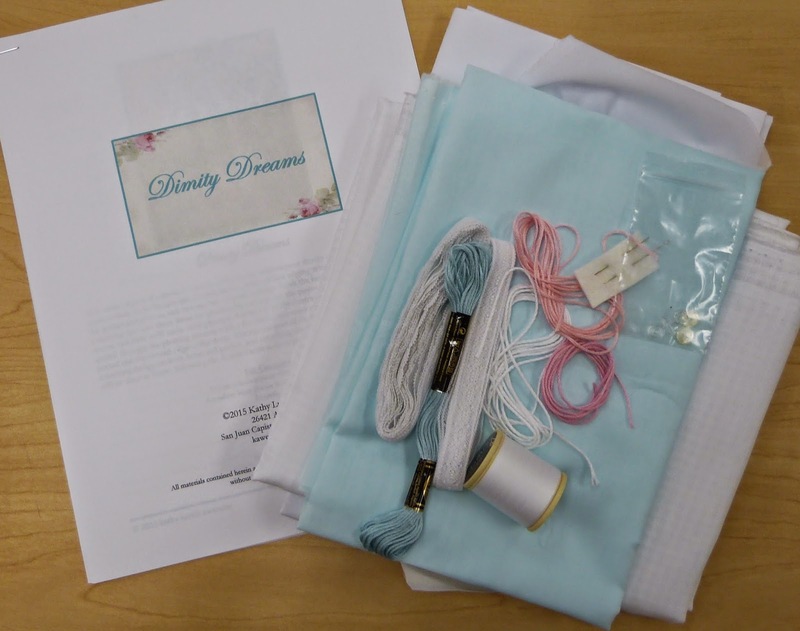 The Dimity Dreams Dress kit contains light blue batiste for the neckband and trim, floss for the smocking, thread, cording, mother of pearl buttons and white windowpane dimity fabric for the dress. 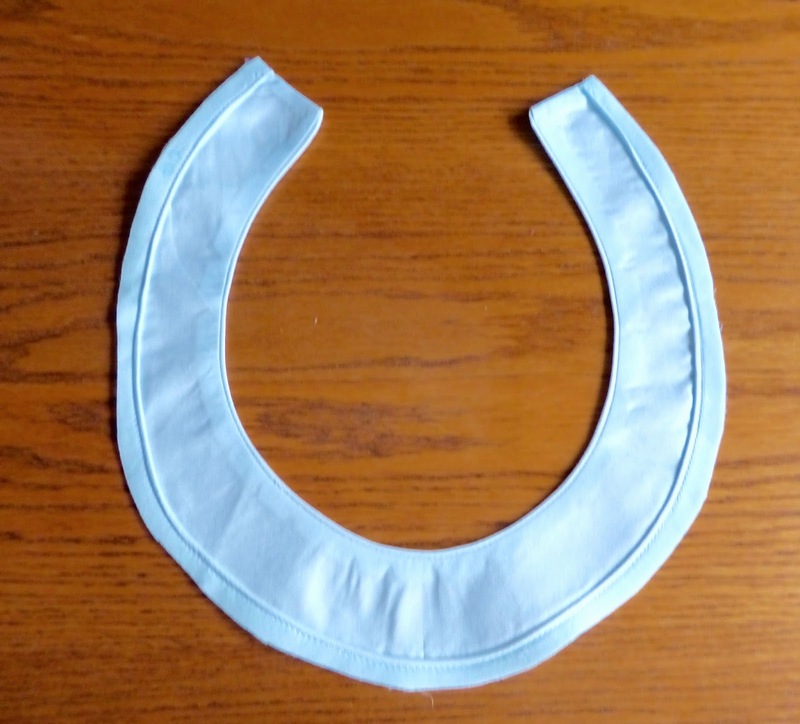 First we had to make piping out of the blue batiste for the neckband. 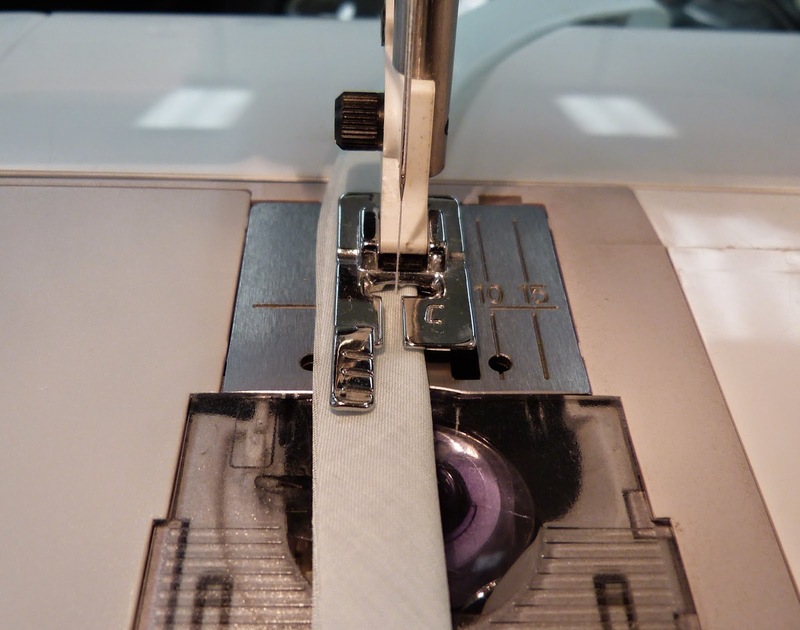 Kathy recommends using a 5 groove pin tuck foot as the tiny piping will just fit into one of the grooves and hold it steady while stitching the seam. However, I didn't bring it with me, leaving it in Colorado. I have an old Husqvarna Viking Designer 1 that is still in the California house, but it only has the feet that came with the machine, minus the zipper foot, which would have worked as well. So I used the buttonhole C foot, which has a groove on the bottom right, and held the cording fairly well. Here we are, hard at work. Kathy is in the light blue on the right of the lower photo. I'm not in the photo, as I was having a seriously bad hair day. The semi completed neckband, which needs a good ironing. And this is where I ended up after six hours of class. I have the sleeves attached to the bodice, and the French seams partially sewn and trimmed. All it needs it to have the final seams sewn, then I can progress on to the pleating and smocking. I don't think any of us have a size 3 little girl who needs a fancy dress, but that never stopped us from sewing a new one! My new grandson is now five weeks old and is growing fast. 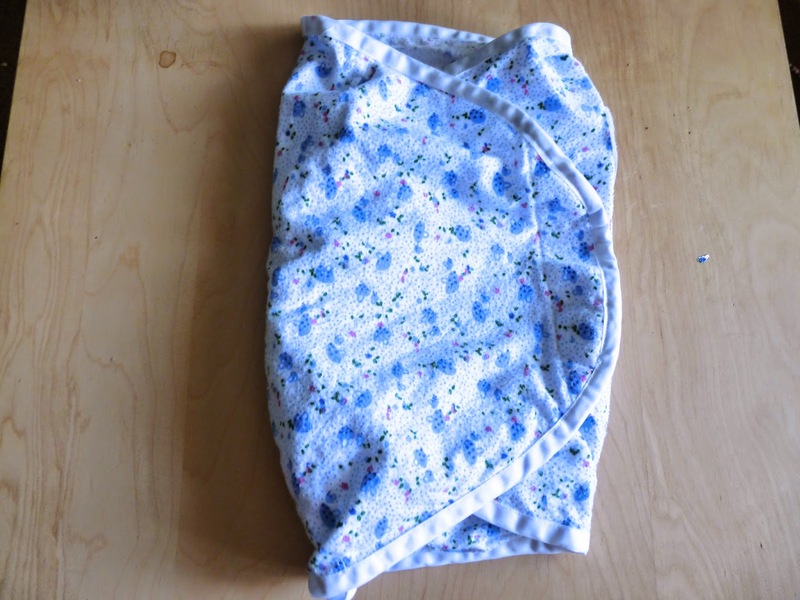 In fact, I made this swaddle blanket for him and he outgrew it at three weeks. It didn't help that he was a big baby, born at 8 lb 13 oz (4 kilos). If you are not familiar with the concept, you put the baby in the little pocket in the center. 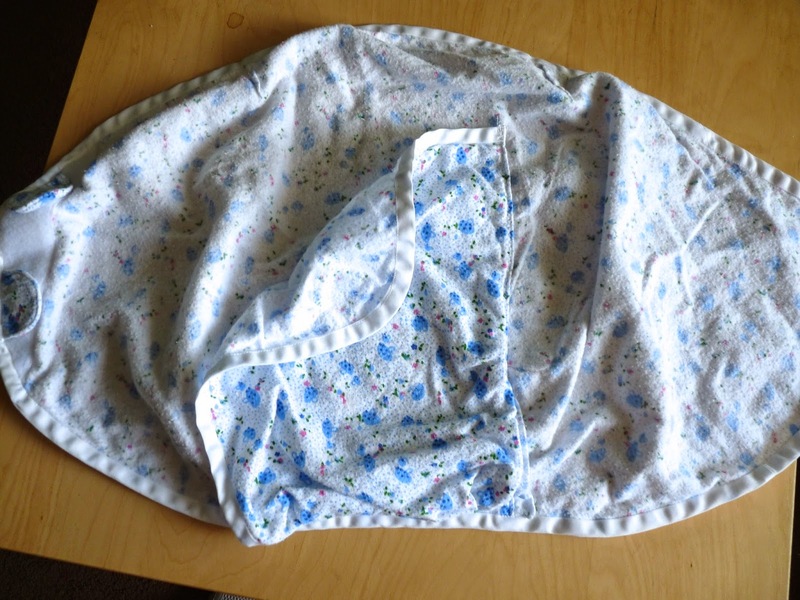 Then wrap the right side over the baby, then the left side, which fastens with velcro tabs, much like the diaper covers available for cloth diapers. Baby is then nice and snug, almost like it was in the womb. From what I've heard, swaddling is only really beneficial to babies under a month old, so he has now outgrown it both by age and size. Please realize that I am no authority on the subject of swaddling, so don't fault me for saying this. I will send this on to my niece, who is expecting a boy in October. For some reason, I had purchased several yards of this flannel, so I made two receiving blankets that are 44 inches (1.125 m) square that still fit him. I'm so glad I did, as he has outgrown all the newborn sized blankets. About ten years ago, when I was commuting from South Orange County (California) to North San Diego County (also California) for work, I passed by a lovely quilt/heirloom sewing shop called Sew Special. The shop is no longer in existence as the owner retired to spend more time with her own grandchildren. At the time I was hoping my daughter (and sons) would eventually get married and have babies, so I bought two quilt kits, one each in pink and blue. 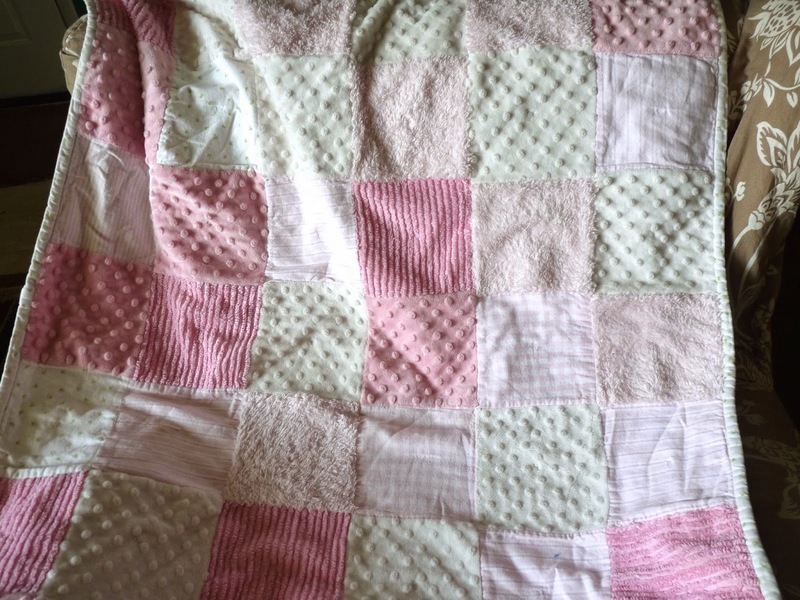 I assembled the pink quilt in 2004 when my granddaughter was born. Then just two months ago I assembled the blue version for the newest grandson. 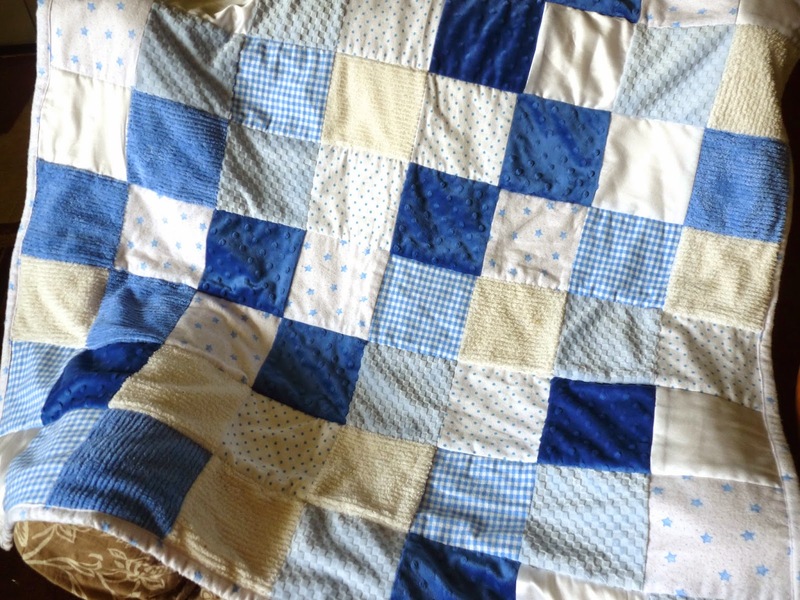 These are really simple, with squares of Minky, flannel, brushed cotton, and another fabrics. They are most certainly not heirloom quilts, but are the drag-in-the-mud type quilts that I hope will be loved. They are nice and sturdy and can withstand many washings.